The work I’ve been doing lately with the Inter-American Development Bank has been looking closely at the opportunities — both the hype and the reality — around big data and urban governance. We’re looking both at the stream of anecdotes and early case studies (though finding most are far short of rigorous) coming out of the Global North from groups like Harvard’s Ash Center, the literature on smart city governance, as well as conducting our own fieldwork and case studies in the Latin America and Caribbean region. A nagging hypothesis has started to take shape in the back my mind, and I thought I’d put it out there earlier to see what others are thinking — but really it comes down to this: why haven’t the whole smart cities / civic tech / open government data / government as a platform / data-driven governance movements triggered, engage, or incited more substantial debate about municipal charter reform? More importantly, what is the relationship between big advances in informatics and municipal reform movements generally? I don’t have much to add here right now — I’m tagging it as a research project for the rest of the summer. 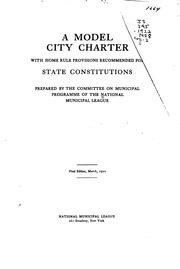 But I’ll point out that the 1890s, the 1920s, the 1960s — periods when in North America at least we saw big waves of ground-up rewiring of municipal government through charter reforms — there were huge waves of innovations happening in informatics and municipal governments were often at the forefront (I wrote, for instance about the instrumental role urban growth had in driving the development of punch card tabulators in the 1890s at the U.S. Census in Samrt Cities; urban police were among the most vigorous early adopters of mobile radio in the 1920s; and of course the U.S. Department of Housing and Urban Development was in many ways created in the 1960s solely for the purpose of bring a scientific, computer-powered approach to urban policy analysis). I think there is a lot of evidence that big leaps in informatics and municipal reform movements tend to be concurrent developments. They trigger, catalyze and influence each other to a deep degree. When society and technology changes fast and hard, cities rewrite their constitutions. Informatics is often a concurrent force. I think this goes beyond just the transparency plank of open government… we can ask this of the entire broader progressive govtech campaign. Why aren’t these various movements digging in, getting beyond the ‘we are going to disrupt you out of business government’ or ‘innovate you agile-ly into a higher dimension’ and get down to the hard business of writing the operating system for what comes after that… which is what charter reform is all about. So why aren’t we talking about new municipal charters for the age of big data? What would these governments even look like? Update: Realized how remiss I would be not to mention a few efforts mapping in this direction though mostly at the national level — Institute for the Future’s Governance Futures Lab and New York University’s GovLab.